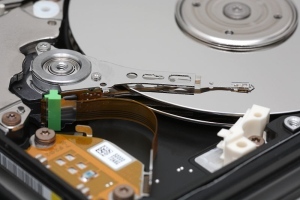 Hard disks are the main form of permanent data storage used in computers and, increasingly these days, portable music players, video recorders and even car music players. In a PC, a hard disk is invariably used to store the operating system (e.g. Linux, MacOS), the application programs that you use (e.g. Firefox, an office suite) and the data that you create, download or receive (documents, MP3 files, email). 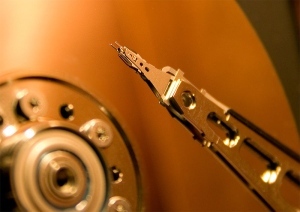 A hard disk drive consists of several main components. The first is one or more thin disks that spin at anything from 3650 to 15000 RPM. The slower speeds - 3650 up to 5400 or occasionally 7200 - are used on laptops, mainly to minimise power consumption and noise. Speeds of 5400 and 7200 and occasionally 10000 RPM (10k) are used on desktop computers where power consumption is not so much of an issue and noise can be more easily suppressed. Drives running at 10k and 15k are generally used only in server computers. The 15k drives especially are very noisy and generate quite a bit of heat. It goes without saying that the higher the rotational speed of the disk, all else being equal, the better the performance. Although there is no physical manifestation of them, the surface of a disk is treated as having a number of tracks - concentric circles (unlike a vinyl disk which has a single spiral). If there is more than one recording surface (usually there are at least two), then the tracks in corresponding positions on each surface are said to form a cylinder (in fact, you can have a cylinder with one track in it but this is now virtually unseen). The disk assembly is rotated at a constant speed by an electronically controlled motor. any slight variations in speed are fed back to the electronics by sensors and this enables them to keep track of exactly where the disk is in it's rotation and to correct the speed. The second major component is the head assembly. This consists of record/playback heads mounted on very low mass but very rigid arms which can pivot so that the heads can be placed over any of the tracks. The pivot that the heads assembly swivels on is a genuine marvel of modern technological engineering, particularly as it is mass produced at such a low price. The head assembly is moved by what is known as a "voice coil". The term comes from loudspeaker manufacturing where the coil which moves the speaker's cone has been called a "voice coil", with some justification!, for around 100 years.